The Kenyan government has been keen on delivering services to citizens through different platforms and especially the internet. To this effect, the government revamped the e-citizen portal seeking to act as a centralized hub for all government services. Which Government departments are on E-Citizen? Some of the government departments involved include the National Transport and Safety Authority (NTSA), Department of Immigration, Ministry of Lands and the State Law Office, under the office of the Attorney General. There plans to add more services onto this portal. 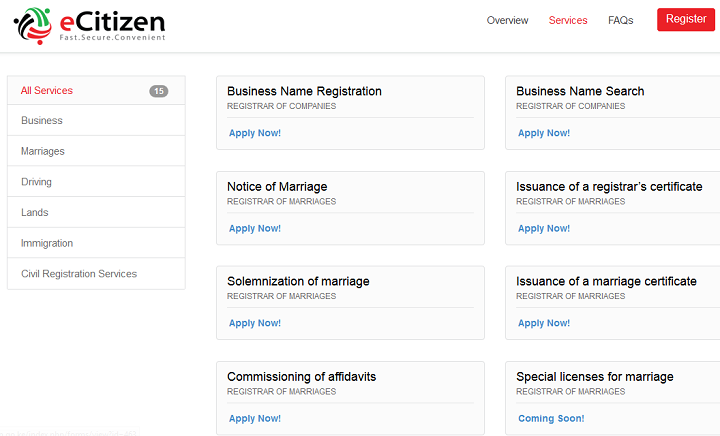 The E-citizen portal currently offers 15 different services to Kenyans bundled under business, marriage, driving, land, immigration and civil registration services. How Do I use E-Citizen? Using the Portal is pretty easy. First one has to create an account based on if they are a Kenyan Citizen, Visitor, Foreigner or Business. For Citizens, the process is a four-step authentication. It prompts the system to ask for your ID number and first name, it fetches the details used to apply for the ID number including the photo. It then prompts to input your ID number, email address and phone number and on verification, prompts you to input your mobile phone number for which a code is sent to input and are done with the verification. The final stage involves adding a photo, if you do not want your ugly ID photo on there and you are set to go. You can then begin applying for the services available. In the 2015/16 budget, the Cabinet secretary for finance outlined an ambitious planned aimed at digitizing payments within the government. The CS announced an allocation of Kshs. 1.9 billion, earmarked for the digitization of 100 inbound payment service transactions for the government by the end of 2015. The government has been implementing e-government services through the e-citizen portal and digitization of the payments was one of the pillars of ensuring success of the portal. In addition, digital payments allow for faster service delivery, reduction in transaction costs as well as safeguard government revenues. The E-citizen portal continues to gain users with an announcement of over 400,000 Kenyans registered on the platform with 8,000 transactions performed. Revenue collections averaged Kshs. 10 Million daily. One of the core aspects in ensuring the success of the platform is the ability to integrate payments into the service offerings. The E-citizen portal is able to accept payments from up-to 13 service providers key among them Safaricom’s Mobile Money service M-pesa. How Do I Actually Pay Via Lipa na M-pesa? Assuming you want t0 search a business name using the portal, navigate to all services, it ushers in all the 15 services offered by the module. Alternatively, you can click on the business tab to access the same. After conducting the search, an invoice is generated for the service offered and the cost. This then ushers you to the payment options. For payments, once can choose between M-pesa, debit card, credit card or prepaid cards. The other option available is the eCitizen agent. Choose the M-pesa payment option and follow the steps below. Step 5: asks for account number, which is automatically generated based on the service you used. Step 6: Enter the amount, which was generated as an invoice. After the payments, confirm on the portal of the completion of the task and wait for feedback. The portal provides proper tracking mechanisms for services, which we shall cover extensively in a subsequent post.